At Nelson Tree Specialists, we’re often asked questions about pruning, so we thought we’d shed a little light on the subject. When is the best time to prune garden trees? Although many people associate autumn and winter with tree pruning, summer is also an opportune time to get your trees into tip-top shape. Getting rid of old or overgrown branches helps to control size, vigour and keeps trees at a manageable height. Thinning of the branches also helps lighten up an otherwise dark green brick wall of shade. It also allows you to let the gorgeous sunshine in – and make the most of the long summer days. 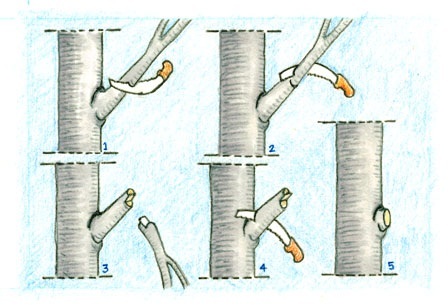 Summer pruning techniques can be applied to most deciduous trees and evergreen types. What is the best way to prune? Don’t be intimidated by pruning. There are lots of methods and techniques – the most important thing is to do it. – The ‘three D’s’ – remove dead, diseased and damaged branches. – Prune to an open vase shape for stone fruit and a central leader form for pip fruit trees. – Don’t be afraid. There is no one right way to prune a tree. No two people would prune a tree in exactly the same way. You learn to prune by pruning! – Use good quality secateurs and saws. When using your saw, cut a branch cut three times so as to prevent bark tears down the trunk – which not only looks bad but also leads to decay. For any large tree pruning work, give us a call – we can give you a complementary quote, so you can make the most of the summer sunshine.